SOCCER VILLA FOOTBALL CLUB AND BASH FOOTBALL ACADEMY-BASH FOOTBALL FOUNDATION AND ACADEMY was found on july 7th 2008 for serious minded youth who need football tarining and dreaming of playing professional football across the world.we can connect you to millions of international FIFA licence agents worldwide through our grassroot football training and youth development.You can secure a summer football camp invitation or trial via our team as well as if you are willing to study and play football in europe. SOCCER VILLA FOOTBALL CLUB-is for quality players that have develop through our training to be promote and grant our first team and reserve jersey to play for the club in any invitational matches or chalenge. FOR MORE INFORMATION PLEASE CALL THE MANAGER ON 08099296521. We strongly believe in the future of nigeria football,so we want to prove we can do it to represent this dearly country in any of national or international tournament. 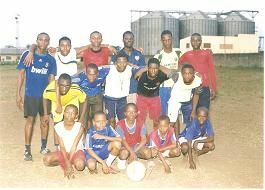 As one of this grassroot footballer with self-discipline and serious mind,we advise you to be yourself and copy nobody and GOD almighty we surely help you and lesds you to your real destination. Todays visitor 2127 visitorson this page!